The Cape Henlopen High School golf team earned its first victory for the 2019 season with a 168-262 win over Polytech High on March 28. Saxon Kalb and Nick Vitolo tied with 42s, and Ben Skelley completed the team total with his 43. Cape won again against Sussex Central on April 2 at Mulligan’s Pointe, 197-223 in windy, cold conditions Coach Rob Harrod described as “brutal.” Dane Palmer’s won medalist again with a 45. Reed Jones posted a 50, good for second best for Cape. Saxon Kalb and Anthony Koot finished the team scoring with a pair of 51s. Finding the right golf clubs for your game became much easier with the advent of club fitting companies. Once regular golfers learned they could match clubs to their skill levels, the market for custom fitting took off. The fact that players could often see their driver distances increase by 15-20 yards with a good fitting also had something to do with it. 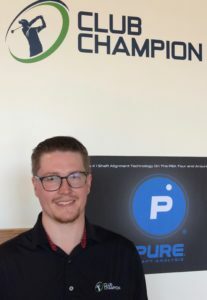 Club Champion is one of the leading companies in the custom fit golf club business, and is currently engaged in a major expansion of their shops throughout the United States. 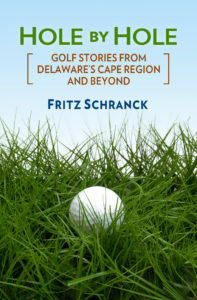 On March 18 the new Delaware Club Champion store opened at the Christiana Towne Center near Newark off Route 273, about 90 minutes from the Cape Region. I met with store manager Taylor Fleig a few days later to learn more about the company and its operation. Fleig is 25, a sports management graduate of North Carolina State, and fun to talk with about golf equipment. He is at the Delaware location to help with the opening period, a role he has performed for several new CC shops. He previously worked at Golf Smith, and made the jump to his new employer after that company closed. Club Champion puts its fitters through an intensive training process. Fleig “shadowed” experienced fitters and then worked under supervision, such as assembling clubs from components. He also did cross training with equipment vendors. The fitting options are as broad as the customer may desire, from a driver fitting all the way to a full bag set-up, which takes about 4 hours. The first step in any club fitting is to know your budget and be clear-eyed about the investment. After-market golf shafts are not cheap. The club heads from the 20 brands Club Champion sells such as Titleist, Cobra, TaylorMade, PXG, and Ping can also command a nice bit of change. Most clubs should work well for five to six years, and if you play often enough the investment cost per round can drop to a reasonable level. Fleig said having that discussion at the outset helps the client avoid unrealistic expectations, while also giving the club fitter the necessary parameters to come up with solutions to fit the budget. For example, I asked Fleig what if a customer asked for a full bag fitting for $1,500. He said their fitters could not do it. Instead, the fitter would work with the customer to find what parts of their game needed the most help, and focus on those elements. A typical driver fitting session begins with a warm-up in the indoor hitting stalls, then establishing a baseline with the customer’s driver for several shots. Fleig said the fitter next has the customer try different heads based on the data. Once a driver head looks most promising, the customer then tries it with several of the dozens of custom shaft options seen on the shop walls. The process usually takes 90 minutes. Fleig noted that more golfers are combining different iron designs to make up their set. “They go with players distance irons at the top end, and then go with players or blade models for the shorter clubs,” he said. Fleig said most of their customer base are men, but said women could benefit even more from the process. For one thing, he is not a fan of the quality control for the “women’s club” models. A visit to a local PGA professional can start amateur golfers on the path to improvement with the right clubs for their game. Fitting companies such as Club Champion usually offer more equipment options, especially for shafts, but golfers should also be realistic about the likely cost.